Ever curious to know how the unique and fun apps or programs you’ve seen on the Salesforce Platform came to be? 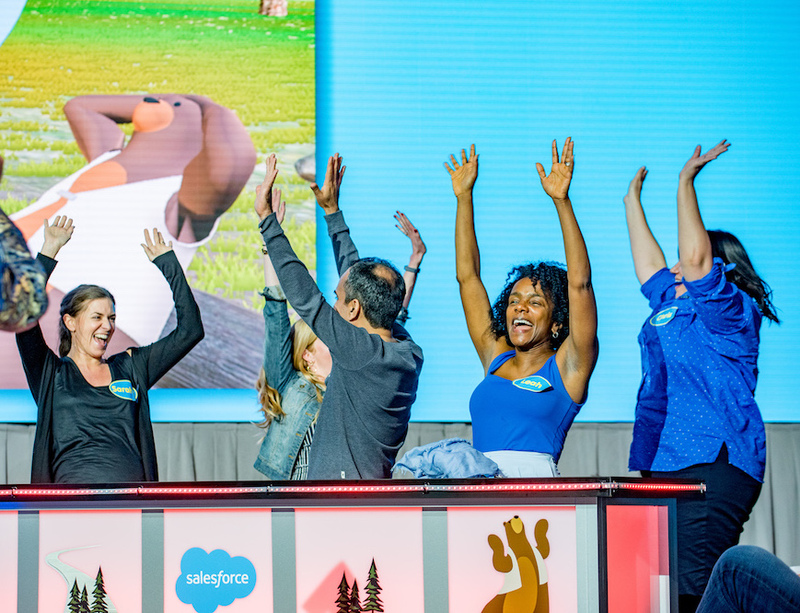 I set out to learn how Salesforce employees created the Ohana Feud game that I brought to the Admin Theater stage at Dreamforce ’18. 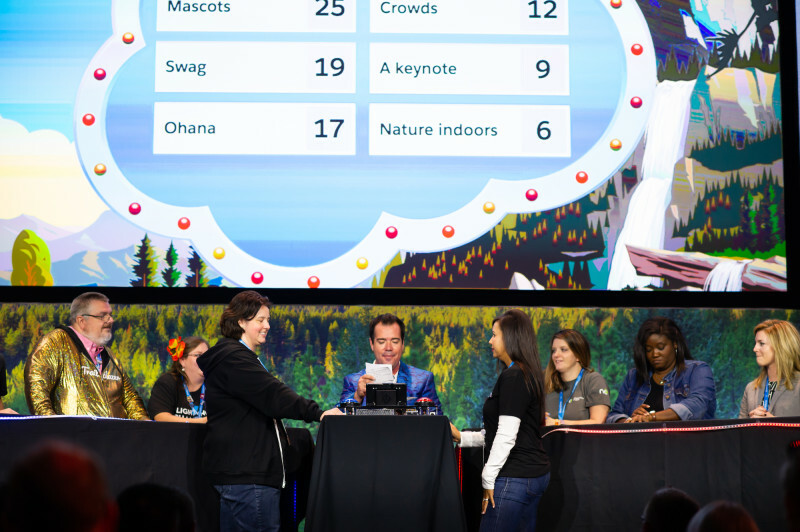 It’s like the popular tv game show, but Salesforce-ified! I wanted #AwesomeAdmins everywhere to learn about how Salesforce employees built something innovative on the platform, and get a big dose of inspiration from it, too! Introduce yourselves! Who are you and what does your team/you do? The game development also benefitted from the work of Luke Ball, Amy Lee, Mathew Kwok, and Cody Henshaw. As you can see, it was a team effort! Robin: Every year at the Innovation Summit we try to come up with something fun, new, and different that spices up the event and gets people connected. I was thinking of new ideas for 2018 and around that time I was asked to do yet another Salesforce survey. I thought to myself, “Wow, we really like surveys. WAIT A MINUTE! 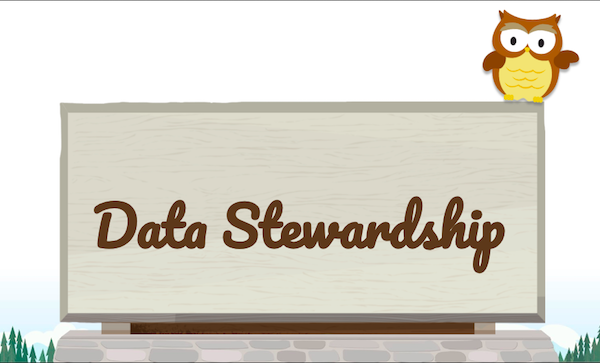 Surveys….Salesforce. Survey Says!” Another amusing note is that I have insomnia and was up at 3am when this idea hit me. I texted John Stormer at 3am and said, “We HAVE to talk in the am – I just had a great idea. 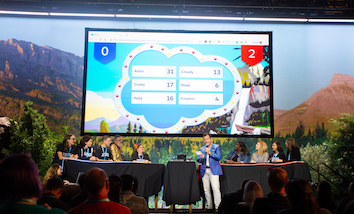 Salesforce Family Feud!” And….the rest is history! What was the process of developing the game like? How did you decide to build on the Salesforce/Heroku platform? Tim: To build a Salesforce-themed Family Feud game from the ground up, you have to start with knowing your audience. Asking the right questions is key; it’s a fine balance. On the one hand, you want the answers to be funny, but we also wanted to create moments that would highlight shared opinions of our audience with management. In order to achieve this, we came up with triple the amount of questions than were needed for the game show. After receiving survey answers, we pared down to just the best question/answer pairs. We built a simple Google form survey with each question we had brainstormed. We knew that short of a “live, studio audience!” we’d need to poll as many employees in our org as possible and get the percentages of answers ahead of time. To recreate Family Feud on a much smaller scale, this streamlined approach was key. The form allowed us to easily collect answers from everyone polled in a spreadsheet and quickly manipulate the data to make the most sense of the answers we were seeing. And there were some doozies… but for the most part we got some amazing insight with plenty of zany, Salesforce fun folded in. So, let’s dig one level deeper on what “normalizing” means. Once we collected the answers during the polling period, we read through each one and made six categories for each question. From there, we calculated the percentages of each of the six categories. Ultimately, that’s what showed up on the board during the live game! Tim: In order to have a compelling heads up quiz game, we needed a buzzer console. There are many options on the market, but none had the level of polish we were looking for. We decided to take the long road of building our own console from scratch. The resulting console has a Raspberry Pi at its heart and is housed in a custom, laser-cut plexiglass body. By building our own, we were not only able to control the design, but able to control ten meters of game-show lighting on the tables. 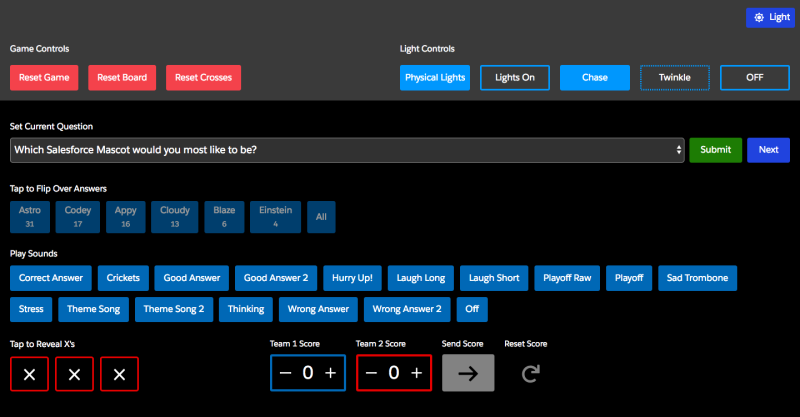 The lighting was important because it gave the audience visual feedback as to which team buzzed in first, red or blue. Joe: Like the buzzer console, we wanted the game board to have the complete branded experience. Starting with the Salesforce cloud logo and a six answer layout, we created a 3D mashup of the two. The resulting model was brought into Unity where we added motion, lights, and dynamic controls. 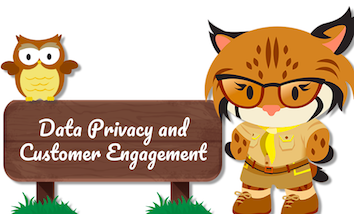 From there we added a campground backdrop and some familiar Salesforce mascots! The initial version of the game ran straight out of Unity. After the Innovation Summit, the team translated the game into HTML and hosted it as a view on a Salesforce Org with some help from Heroku. Game instances are now custom objects inside of Salesforce with Questions as Custom Records. The HTML version of the game can be administered with clicks not code. There is currently only one physical game console but multiple instances of the game board can be run simultaneously. This is what you saw on stage during the #AwesomeAdmin Ohana Feud in the Admin Meadow at DF18. Did you run into any challenges along the way? How did you solve them? 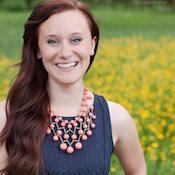 Robin: We struggled over some of the more hard-hitting questions that referenced Salesforce values and culture. In the end, we dropped a few of the more controversial ones. Not because they weren’t important (THEY WERE), but it would have changed the tenor of the experience so we dropped them. Tim: Exactly what Robin said. There were some insightful “statement” questions we had in there, but we realized that there’s a time and a place for topics like that and the middle of a fun gameshow was probably not the right place to have those discussions. When creating those questions, keeping in mind the types of answers you’d like to see, and also that you’ll get answers you’d never expect, is important. Talk about the first time you used the game in real-time with an audience. What was that like? Tim: I would be lying if I told you I wasn’t freaked out about it. It’s one thing when you’re playing a board game with friends and you feel a little bit more comfortable in saying whatever you want. It’s a completely different thing when you’re doing it front of 500 co-workers. I was worried I’d say something stupid, or the jokes wouldn’t hit…and a billion other concern. But, it turned out those fears were totally misguided. Robin: We were a little nervous bringing it live to the 500 people at Innovation Summit, but the 1st round on the 1st day was a HIT. We ran it three times a day—after each break at the Summit to get people back in the room. I’ve never seen 500 people at a conference scramble to get back in a room to start the next session so quickly in my life. Tim: It was definitely worth all the hard work to see that excitement from the audience. After all was said and done, the feedback was amazing and we’ve been asked to take it on the road for a variety of events since. What did you learn from building this? Tim: What I learned is that taking a big risk like this and seeing it through is worth it. Part of why I love working at Salesforce is the culture and this was a great example of how we were able to create a culture like this in the first place. To be able to work on a team with a big idea like this—which admittedly is a bit crazy—and to see it through was incredible. In another company the fear of failure—of having everything go sideways in such a high visibility fashion—might stop this project from ever happening. Here, we felt that it was worth the risk and everything worked out great! What was your favorite part about building this game? Robin: The team of myself, Tim, Joe, and Luke really gelled while working on this. That made the execution even more fun! Joe: Seeing Tim in his element (as host) was hilarious. That said, my favorite part was the tangible excitement in the room. Everyone was engaged, whether they were playing or watching. Tim: I’d say working with such a strong team was really the highlight. I’m still floored about what we were able to accomplish—and how fun it was to build. We hope you were able to catch Ohana Feud live in the Admin Meadow at Dreamforce ’18, but if you weren’t, you can watch that here. Have you been inspired to build something creative and fun on the Salesforce platform? Tell us about it in the comments, or share find us on Twitter and share with hashtag #AwesomeAdmin.